What does SharePoint Data Doc do and how does it do it? SharePoint Data Doc makes it easy to work with SharePoint list data from within MS Word. Query your data on SharePoint with the custom query builder and input it directly into your active document. Merge tables of data from your SharePoint server directly to your active MS Word document. Save documents with SharePoint Data Doc bookmarks, and then re-use them to make your document processing a breeze. Utilise the batch functionality to automate the generation of your documents from your SharePoint data and save yourself a lot of time and money. SharePoint Data Doc uses Windows SharePoint Services to return the data you need from your server at top speed. By specifying named data sets you can add field identification bookmarks to your active document. SPDD then uses these identification bookmarks to position the data that is returned by the user, into the active document at the correct location. You can add the SPDD bookmarks over existing text in your current documents to turn them into live data documents, all your text formatting such as font, size, italics etc will be preserved when the data is written to the bookmarks. It is incredibly quick and easy to set up and requires no input from an administrator, just the user login details you already have for logging onto your server in a browser. You can be adding live SharePoint data to your MS Word documents within a few minutes. SharePoint Data Doc uses Windows SharePoint Services to attach to your site and download your data. It is compatible with and has been tested against both SharePoint 2007 and SharePoint 2010. • Provides seamless and dynamic integration of SharePoint list data into MS Word documents from within MS Word itself. • Ever wanted to batch update a SharePoint list but couldn't? Create Queries that can batch update your SharePoint list data with no code whatsoever. This is one of a kind functionality that can save you big $$'s in software development costs. • Easy to Set Up: Need only run a single setup on each machine, then activate online. • Easy To Use: Add a bookmark, fetch the data, choose a record, it’s that simple. • Fast: Takes a tiny fraction of the time compared to opening up a SharePoint site, looking for the data then copying it across. • Efficient: Set up your templates correctly and mass produce MS Word documents using your stored SharePoint list data. • Easy to Deploy: Deploying with a commercial SharePoint solution could not be easier, simply create the XML settings file and your systems document templates and roll them to your users. • Easy to Integrate Existing Documents: Open an existing document, highlight the area where you want to add dynamic SharePoint data, add a SharePoint Data Doc bookmark and save the document. It can now be dynamically filled by fetching the data anytime you like or used to create batches of documents. • Define Table Definitions from SharePoint list data and insert into MS Word documents quickly and easily. 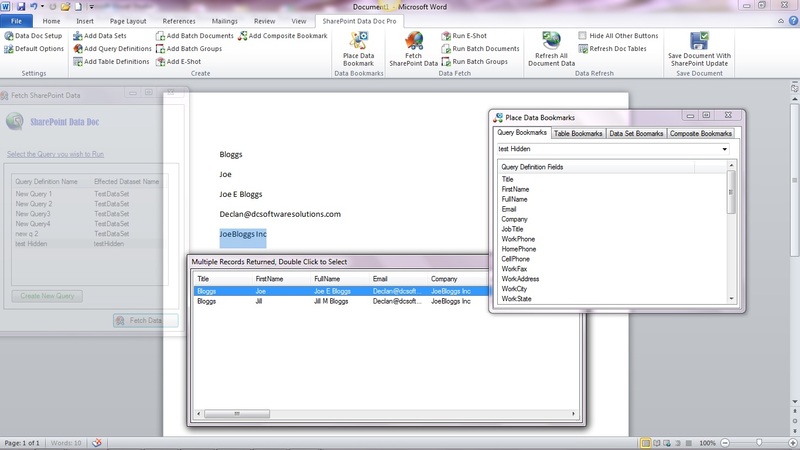 • Automate the batch creation of documents for bulk mailing using data from SharePoint lists. • Create E-Shots to automatically send bulk emails, generating content from SharePoint List Data and sourcing email address from there too. Once you have created an E-Shot definition you can send one with a single click of a button any time you like. • Generally no administrator input is required, you can simply use the username and password that you currently have to access SharePoint within your browser. • Administrators can centrally create the document Templates and the XML settings file and roll the functionality to many users very easily. • Users can easily add their own templates by simply adding the correct bookmarks to their documents and saving them. They can then download data directly to the documents whenever they need to. 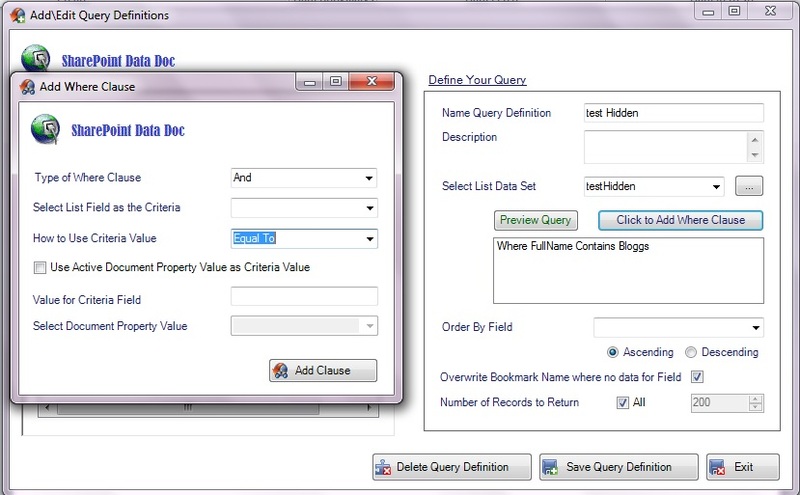 Using the custom query builder you can identify and return the data you need in a snap! SharePoint Data Doc uses a CAML query builder to create the CAML statements that return the data to your MS Word document using Windows SharePoint Services. This is an extremely efficient way to return data, however CAML is difficult to construct and not well known. For this reason the query builder allows users to easily specify search criteria to use against the data in the SharePoint list to which it is connecting. For example, if a user wanted to return all of the records from their Contacts list who had a last name contain "col", they can set the criteria value to the LastName field of their Contact list data set, then in the query builder select the "Contains" option and enter "col" in the criteria text box. A CAML query is generated and run against the appropriate list, returning only the data that the user wants to their document, table or batch setup. No more wasting time logging on through your browser, the query builder can help you to get the data you need in seconds. Quite simply the best and easiest way to bring your SharePoint data into your Microsoft Word documents. · Added the ability to carry out a batch update to a SharePoint list (! ), this is very powerful functionality that is usually not available without coding. So, it is located within the Table Definitions screen and allows you to update field in all of the SharePoint list items returned for the table query. You can select a Server Managed Document property from which to source the update value, or you can enter a literal value to update, while also selecting the field that you wish to update. Remember that if it is a Yes/No field then you must use 1’s and 0’s as your update values. 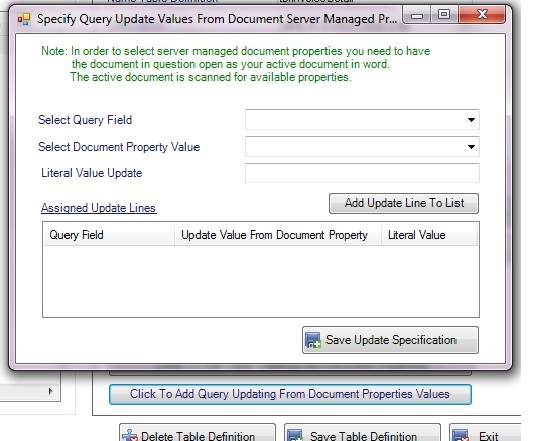 Once you have created the Update Query you can run it by refreshing the table in your document from the Ribbon and then select the Save with Update button from the Ribbon, which will execute the query. All your SP list items for the fields and values specified will be updated in one query! Add SharePoint list data directly to your active Word document at any time and from any list. Ad Hoc, on demand, flexible reporting of your live SharePoint data without any server installs required. Automate batches of documents to mass produce standard letters etc from your SharePoint list data. Automate batch emails in an E-Shot using SharePoint list data to build content and source email addresses. Automatically attach generated documents to automated emails and send all with a single click. Create Batch Update Queries to update SharePoint List data with absolutely zero code - There is nowhere else that you can find functionality like this! Query SharePoint list data from within MS Word client. No Administrator input required to use. Easily convert your current standard documents by simply highlighting variable text and adding a SPDD bookmark. Preserves document font formatting such as italics, bold and color etc. Use multiple SharePoint Lists as the source for a single documents data. Define and store Query Definitions for re-use. Define and save Table Definitions to be used time and again. These are based on Query definitions. Pop a bookmark for a Table Definition into your document in the same manner as a normal data field. Dynamic tables can be placed in Batch Document templates, they will fill with live data during creation. Tables can be refreshed with Live data at any time with a single button click. Entire document data can be updated with live SharePoint data at any time with a single button click. Create and use Composite Bookmarks in your documents, amalgamated from multiple SharePoint list fields to create address blocks etc. Define and store batch jobs, users need only select a batch and run it, could not be any easier to use. Application wide default field format settings, define field format when loaded from server. Add Alias' to your individual fields and use this to make table columns display whatever you want for a given field. Advanced column options including column width, background shading, fore color and font size allow you to create eye catching data tables. Very easy to package template merge documents with your custom SharePoint solutions with No coding required. Create WSS Security settings file and roll to your users. Create custom datasets reading from your own custom list data, and roll these details to your users. 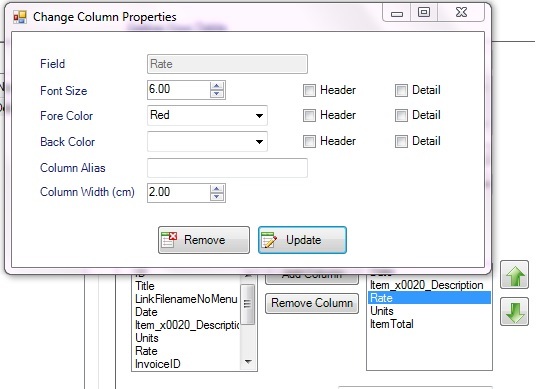 Easily create merge template documents specific to your application and roll to your end users. Easily transform client documents into merge template documents specific to your application and roll these to your end users. Copying one file, DDXMLStore.xml, to your users Documents\DataDoc\ folder transfers the details for WSS connection and the data sets required by packaged templates. Cost and time effective when compared with bespoke development.